Yesterday’s Guardian revealed a trio of leaked documents from the International Monetary Fund, the European Central Bank, and the European Union that revealed the true extent of Greece’s debt crisis. The documents – written by the tripartite collective commonly known in Greece and now much of the world as the troika – revealed that the institutions are not only aware that Greece’s 320 billion euro debt is unsustainable, but that even if the Greeks adopted the newly proposed memoranda of understanding, there is no chance the policies proposed would go anyway in clearing the debt. Instead, they propose ratcheting up Greece’s austerity by another notch, increasing the torture of a nation which has already lost 11,000 of their people to suicide as a result of the internationally-imposed austerity programme of the past five years. In Greece, debt means death. As a result of the troika’s programmatic demands, upon which a steady flow of capital to the Greek financial system is reliant, a quarter of the Greek economy is dead. Unemployment has spiked to levels higher than that of the pre-war slump of the 1930s, with youth unemployment particularly high at 60%. As the state is worn down, and the protections it gave evaporating into the air with each moment that austerity continues, civilisation steadily collapses around the Greek people. Social unrest is high, the police have been infiltrated by the forces of the far right, with half of police officers voting for the openly fascist Golden Dawn in the 2012 general election. Wages drop by the day, basic necessities are unaffordable to the poorest of Greeks, with solidarity networks fuelled by hard working militants, young and old, springing up to ameliorate the worst effects of the crisis where once the state would have intervened. It is in the face of such barbarity that the SYRIZA government has come to power. 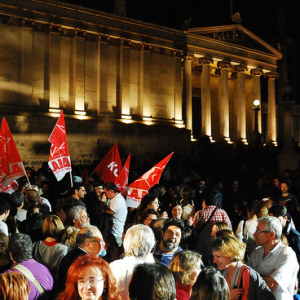 The Coalition of the Radical Left, a confederation of various elements of the Greek far-left born out of the communist tradition, has sought to end the torture and give people hope, only to face a coup by the troika. Influenced overwhelmingly by theorists of the Eurocommunist and New Left traditions, particularly the works of the late structuralist Nicos Poulantzas, the corner stone of SYRIZA’s governmental programme is the transformation of the state from the pawn of the ruling class into a weapon, defender, and liberator of the people against the forces of capital. A product of a snap election, the governmental programme is a lighter form of the party’s full programme which calls for a “militant and dynamic multidimensional movement of subversion” by the popular classes (i.e. working and lower middle class) of Greek society to overcome neoliberalism. Yet to do so, they must first confront the debt that is rapidly crushing them. Following an official parliamentary investigation, speaker Zoe Konstantopoulou, a lawyer elected on a SYRIZA ticket, described the debt as “illegal, illegitimate and odious”. The report commissioned by Konstantopoulou and written by a parliamentary committee has found much of the country’s 320 billion euro debt to be illegally contracted and should thus not be repayed. Less than ten percent of Greece’s debt has actually passed through the Greek economy, the majority of the money loaned to the impoverished state has simply passed straight back to the creditors, primarily French and German banks, with the Greek people being forced to prop up the failings of the central European financial sector. Alexis Tsipras, the Greek Prime Minister, has called a referendum this Sunday on the troika’s new bailout proposals and despite advocating an ‘No’ vote, is still wedded to the notion that Greece has a future in the Eurozone. Others, such as the SYRIZA’s Left Platform’s Costas Lapavistas, an MP in the Hellenic Parliament and Professor of Economics at London’s SOAS, have developed a comprehensive alternative economic strategy for the inevitable Grexit that is to come. A default on the majority of the debt and return to the drachma is both imminent and necessary for the Greek people to survive the crisis that is killing its people and causing many of its young to flock abroad to survive. Despite Tsipras’ assurances that a ‘No’ vote is a vote to continue negotiating inside of the Eurozone, it is now clear to the vast majority of Greeks that such a vote is a vote to leave the Eurozone. With a hefty repayment due to the European Central Bank on the 20th July and public finances scarce this repayment is unlikely to be made and subsequently Greece is likely to spiral out of the Eurozone. A ‘Yes’ vote would result could see Greece adopting the new proposals of the troika and the resulting political crisis would see SYRIZA resign from governmental office so as not to be forced to implement further austerity and kill off any hope of economic recovery in the next decade. In the past couple of years, capital has fled Greece by the billions. With the announcement of the referendum came announcements of controls on capital, Greeks are now limited to withdraw at most 60 euros a day and all large transfers abroad are subject to license by the finance ministry; necessary in the face of the economic warfare led by the troika in response to Tsipras’ call for the will of his people to decide their future. The consequences of adopting the troikas’s proposals will ensure barbarism reigns supreme; the Left Platform’s Plan B means a short sharp shock to the system that would, it is predicted, lead to real economic growth within a year and the end of the misery of an indignant people. Early polling indicates 52% of Greeks will vote ‘No’ on Sunday, with 29% voting ‘Yes’. Having already (as of midnight) missed a key repayment to the International Monetary Fund, the beginning of the end of Greece as a member of the Eurozone is already upon us regardless of the referendum result. On Sunday the Greek people will take their future in their hands, if they vote ‘Yes’ they will be voting for their continual misery, if they follow the advice of their government, they will vote for dignity and for self respect. Here’s hoping they do just that. Posted in: Europe, Ideology, International, Politics. This article is absolutely spot on, the only safe way is to leave the EU and return to the Drachma. They can then govern themselves or starve to feed the Bankers. That’s not going to happen after this was written we find out they have accepted all the the cuts except for one the pension age for retirement they are asking for it to be put off for a while, so the left has slowly moved to the right, anything new in that. No way would Greece leave the EU and as we see now the Government has accepted the cuts for which they were elected to fight. Two things really, 1. they have not signed on the dotted line yet. 2. If they do, they will be back again the next time with the same problem. How much longer can this Greek Govt keep stringing the EU along? Call their bluff Angela, and close them down. So you support right wing Tories against the ordinary Greek people do you? That said please bring it on. No-one is saying that it will be a ride in the park, but at least they will be in command of their own futures and not dictated to by Neo-Liberals that are selling us all down the river. Yes Greece must be broken for daring to challenge Neo-Liberal austerity. Yet the big EC counties all bailed themselves out with trillions of quantitative easing, a policy tool which they denied Greece. An excellent piece in the recent New Left Review shows that Germany is not as strong as it makes out, being mainly sustained by engineering exports to China, and whilst pay in this sector is very high, for the rest in Germany it has been wage suppression, and it is argued that Germany itself has infact broken the Maistrict rules. But then again to the right wing hypocrites at the top in the EC, rules (like only little people paying taxes) are perhaps there only for little countries. Owen Jones has a good piece on today’s New Statesman website in which he calls for an EC Debt Restructuring Conference (we should write the debts off) and he quotes Nobel Prize winners Krugman et al who call for quantitative easing to be used to fund productive investment which should be state led, as well as investing more on energy renewables. And I would add and more democratic public ownership including some banks (who caused the mess in the first place but are now the main beneficiaries) plus a 1% EC Financial Transaction Tax (better than the piddling 0.1% Robin Hood proposed tax) & an EC Common Corporate Tax. So solidarity with Greece, and the Left in the EC needs to unite to campaign to reform the top down EC and to kick Neo-Liberalism out! Good article and several excellent and well considered responses. Cheered me up no end and in a way I draw some strange hope from the fact that this kind of discussion is even taking place again. The Labor, (Labour,) party was so massively dumbed down under Blair that it too often seemed to have be forced into some kind of semi permanent and induced vegetate state and to have all but lost even the basic will to live. a man who was part of an independent and nonconformist intellectual tradition that has shaped this country for the better. We abandon it to cheap popularism at our peril. Well people can call for a lot of things, Greece wanted the debt cancelled Merkel would have kittens , now this referendum if the vote is yes to Austerity we are hearing about a government of unity. In other words Brussels has won and the poorest in Greece had better get ready for soup kitchens and poverty . And I think the vote will be yes to Austerity and the socialist government will fold it will be gone. The fact is it’s not Brussels that’s running the EU it’s Germany the rest are just playing politics. But around the whole of the world we are seeing a realignment of the rich and the poor . Look at what labour are saying now, we will drop the plan for a 50 top rate of tax and accept that it should be 40p. The mansion tax has gone and basically what labour is offering is Tory Lite again, but the Tories are back they are not weak they are strong it’s labour that’s in trouble. Says it all really as the Progress drones now come out to agree with the Tories Miliband lost so now turn to the right to try and out do the Tories, it will never happen. But the issue is the same in the UK cuts to the bottom and love for the rich, nothing has changed except we no longer have a socialist party. Unless of course Corbyn can win. If “Yes” wins and the government resign there is every likelihood that Syriza will be re-relected to power if they take 35% or so of the vote. What then? There is clearly a problem with the right dominated media in Greece; “Yes” adverts are dominating TV. Any socialist government has to challenge capitalist media ownership.